The primary objective of a renowned stock exchange is to facilitate trading of stocks among buyers and sellers. The movies have gloriously shown us stocks being traded in an office where numerous traders are shouting and blaring over the telephone with their clients. This depiction may not be very far from the reality. Stocks are transacted on known exchanges where individuals may purchase stocks from others. This transaction can be made through online stock trading or offline brokerage firms. The primary objective of a renowned stock exchange is to facilitate trading of stocks among buyers and sellers. A shareholder or investor approaches a depository participant and creates an account. With the opening of the account, the shareholder receives an identification number called ‘Client ID', which serves as a reference point for all dealings and communication with the depository participant. The investor fills up a Dematerialization Request Form (DRF) to be provided by the depository participant and gives it over together with equity certificates suitably canceled by writing ‘submitted for dematerialization' to the depository participant for demat. The depository participant will receive certificates listed only in the term that keeps the share certificates. When the DRF along with the original share certificates has been received, the depository participant sends an electronic appeal to the company through NSDL for validation of demat and at the same time submits the shareholdings. DRF and share certificates go together with the regular letter to the company for demat authorization. A company must include the necessary hardware/software ability. It must be connected to the NSDL system via the V-Sat connection. Once receipts of the DRF and share certificates of the stockholder are received, essential confirmation is prepared and demat is sent to NSDL by the administrator. 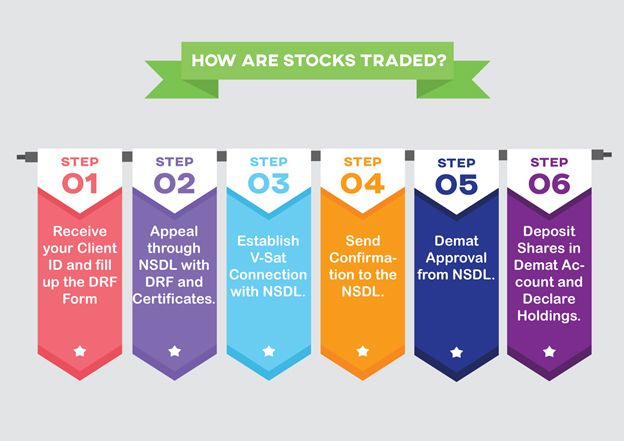 NSDL then further approves demat to the investor's depository participant. Depository participant deposits some shares in the shareholder's account, which are dematerialized, and after that, the stockholder keeps the securities in electronic form. The depository participant of the investor provides a declaration of holdings and updates accounts after every transaction. A depository is the leading player in the system and is essentially organized as a business. The depository may not involve itself in the procedure unless it is listed with the SEBI within the SEBI (Depositories and Participants Regulation), 1996. It is an organization where the securities of a shareholder are kept in electronic form via the medium of members. A stock exchange is a platform where financial instruments such as equity and derivatives are transacted. Market contestants have to be listed on the stock exchange and SEBI to execute trades. This comprises of businesses issuing shares, brokers directing the trades, traders, and investors. All of this is controlled by the Securities and Exchange Board of India (SEBI), which creates the rules of conduct.